Like thousands of other Calgarians, we headed west for the August long weekend. We knew the trails would be pretty crowded, so we spent a bit of time last week planning for this weekend’s hike. 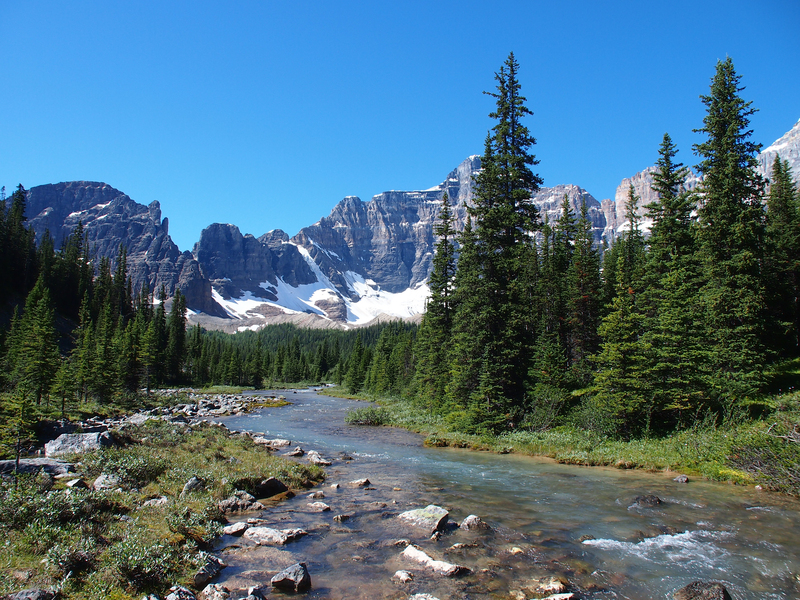 Our criteria: in Banff National Park, a longer hike (at least 15 km) which would deter most casual hikers, somewhere we haven’t been before and a hike with some great reviews. The approx. 20 km (12.5 mile) trail to Lake Annette, continuing into Paradise Valley to the Giant Steps seemed to fit all our requirements, so we left early enough that we arrived at the trailhead just after 8:30. There were just a few cars in the small parking lot (no outhouses) and one fellow was busy studying the trailhead signage. Since restricted access is currently in effect (hikers must travel in tight groups of four or more), he was hoping to join up with us if we were just hiking to Lake Annette. Since we planned to go all the way to the Giant Steps, he elected to wait around for another group. 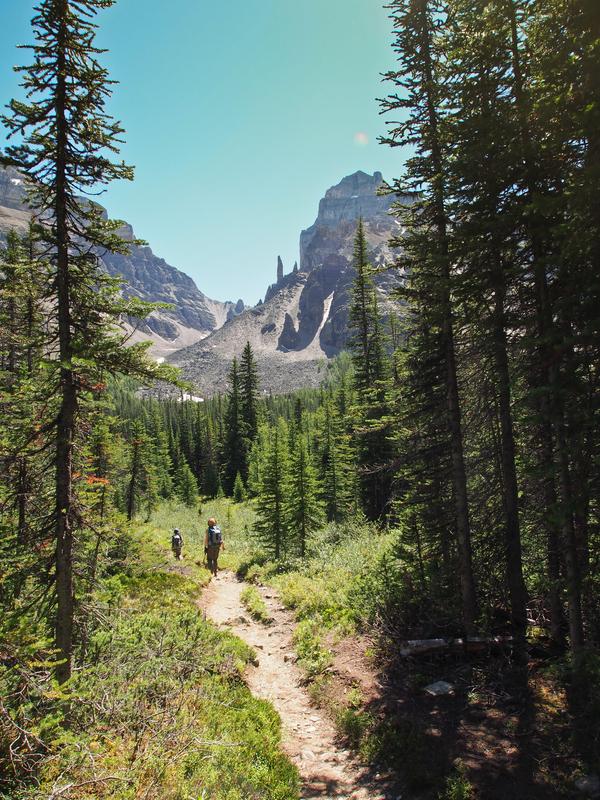 NOTE: trail conditions and any restrictions are regularly updated on the Banff National Park Trail Report. The first 3 km (2 miles) are a walk through the forest. One of the first things Mrs. GeoK noticed is that the bushes have all been stripped of the berries, which explains the many bear sightings in this area in July. There are a few minor creek crossings and lots of wildflowers, but it’s not until you reach the first bridge across Paradise Creek that you get your first glimpse of Mount Temple. It was right about here that we passed another group of four – and we bumped into them several more times throughout the day! At 3.9 km, the second bridge offers a more expansive view of Mount Temple to the southeast and Sheol Mountain to the northwest. Although Mount Temple loomed over us, the sun angle made any good shots in that direction pretty much impossible. Instead, Mr. GeoK aimed his camera to the northwest towards Sheol Mountain (left) and Saddle Mountain (right). The second bridge across Paradise Creek sits in the foreground and is located about 4 km from the trailhead. After following the creek for about 10 or 15 minutes, at the 5 km mark there’s a third bridge across the creek. From there, it was a short and somewhat steep climb up to Lake Annette. It’s a pretty lake, quite small in comparison to Bow Lake or Moraine Lake. But on a long weekend in August, you’re much more likely to find peace and quiet here than you are at either of those other two spots so popular with drive-up sightseers. 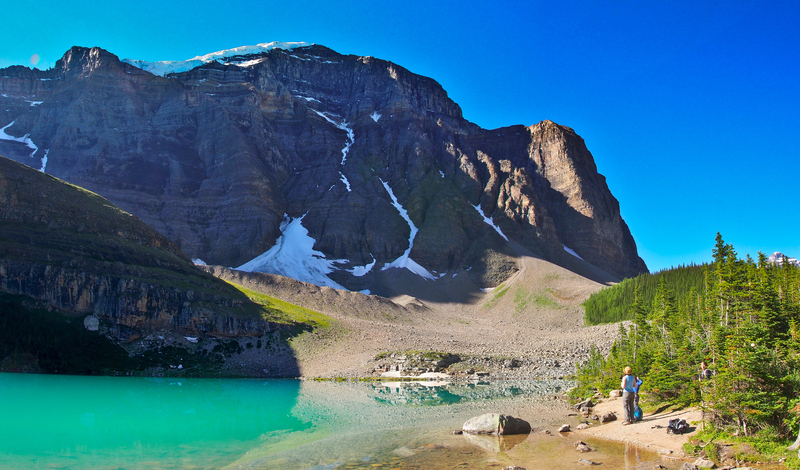 Lake Annette, in the shadow of Mount Temple, shows that distinctive turquoise-green colour that is typical of our beautiful Canadian Rockies’ lakes. Much smaller than the much-visited nearby Moraine Lake in the Valley of the Ten Peaks, Lake Annette is about 5.7 km from the trailhead. If you value peace and quiet over ease of access, Lake Annette is a decent option. From Lake Annette, it’s another 15 or 20 minutes of climbing through mixed forest (lots of larches here, so this would be a great fall hike, too) before reaching the trail summit at a major rockslide. It was here that we heard the first of several rockslides that would punctuate our time in Paradise Valley. And also from here, the view to the head of the valley was breathtaking. 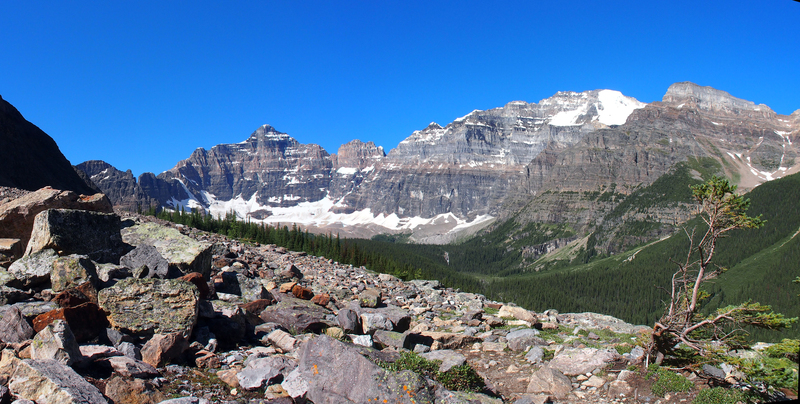 After a 15 – 20 minute climb from Lake Annette, we left the forest behind as the trail opened to the valley headwall. With Mount Temple (the tallest peak in the Lake Louise area) towering over us on the left, our eyes were still drawn to the remnants of Horseshoe Glacier at the end of the valley and the lush green slopes on the other side of the valley. From here, the trail crosses a rock field before reaching the junction to Sentinel Pass, just about 2 km on. Another look at Paradise Valley, this time looking more to the northwest from the trail summit. We made quick time across the rockslide and re-entered the forest, where the trail was criss-crossed by numerous small creeks (with some tricky crossings) and bordered by small open spaces blanketed with wildflowers. We paused at about the 8 km (5 mile) mark to take note of the rock pillars that seemed to us to be “the sentinels” of Sentinel Pass. Shooting straight into the sun doesn’t produce great photos, so this is the best of a bad lot. But it should give you a general idea of what “the sentinels” look like near Sentinel Pass. The rock pillars seem to be standing guard over the approach to the pass. 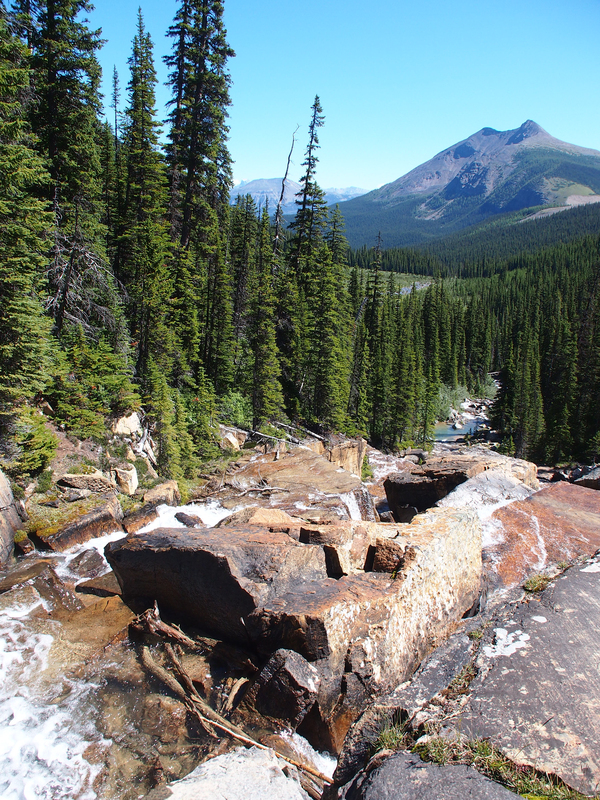 This is the view from the Paradise Valley trail, just about 200 meters before the junction with the Sentinel Pass trail. Taken on our return trip, here’s another look at the rock pillar “sentinels” guarding Sentinel Pass. From the junction with the Sentinel Pass trail, the GeoKids were pretty dismayed to see we’d be losing a bunch of elevation. The trail from here to the Giant Steps is a little rougher. The switchbacks are well-constructed, with some buried logs to divert water and help with trail integrity, but several trees were down in this area making it a little slower going. Down in the valley, we crossed Paradise Creek for the last time, about 600 meters from the Giant Steps. There’s a back-country campground just a few hundred meters from the Giant Steps, but when trail restrictions are in effect, this campground is closed. We passed the junction to the campground and continued on to the main attraction. The rocks turn very slippery when the water’s running across them, so the final approach to the Giant Rocks is via a raised boardwalk, which both protects the area and prevents hikers from slipping. 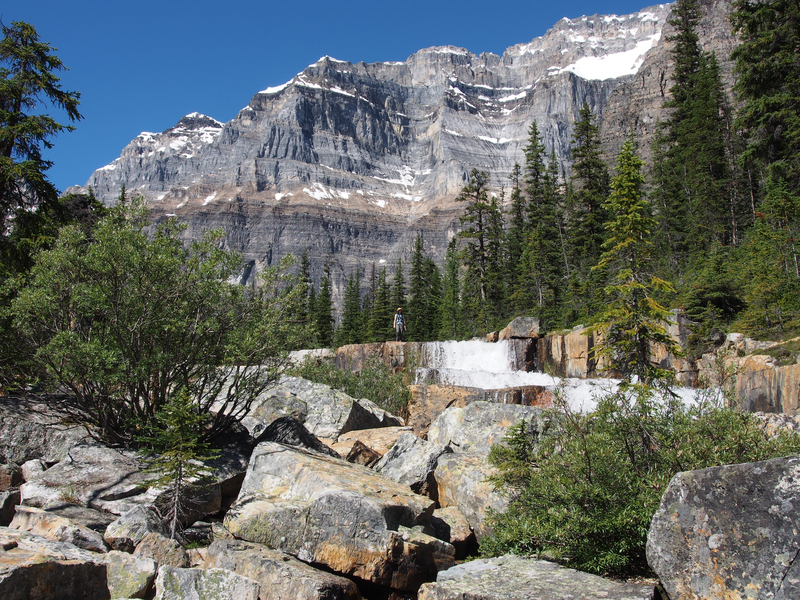 Mrs. GeoK was quick to find her way to the top of the Giant Steps, a stepped waterfall on another arm of Paradise Creek. Ringrose Peak is in the background. Upstream of the Giant Steps, it’s as if nature laid down a solid stone bed for this arm of Paradise Creek. This whole area reminded us of some of the hiking at Lake O’Hara. C does a great job of longer exposure shots, although it’s a challenge getting him to take the time to download from his camera to share with the rest of us. Maybe someday we’ll see get a chance to see how this one turned out! After exploring for 15 or 20 minutes with our cameras in hand, we found a quiet spot for lunch. Unfortunately, the mosquitoes and horseflies decided the same spot was just right for them. So we didn’t stick around for desert but instead started our return trip. Three other groups arrived at the Giant Steps while we ate and we passed several more on the way back. I estimate there was somewhere around 3 dozen hikers on this trail on the Saturday of a long weekend – pretty quiet! Looking down the valley from the Giant Steps, the northeast shoulder of Mount Temple is visible in the distance. 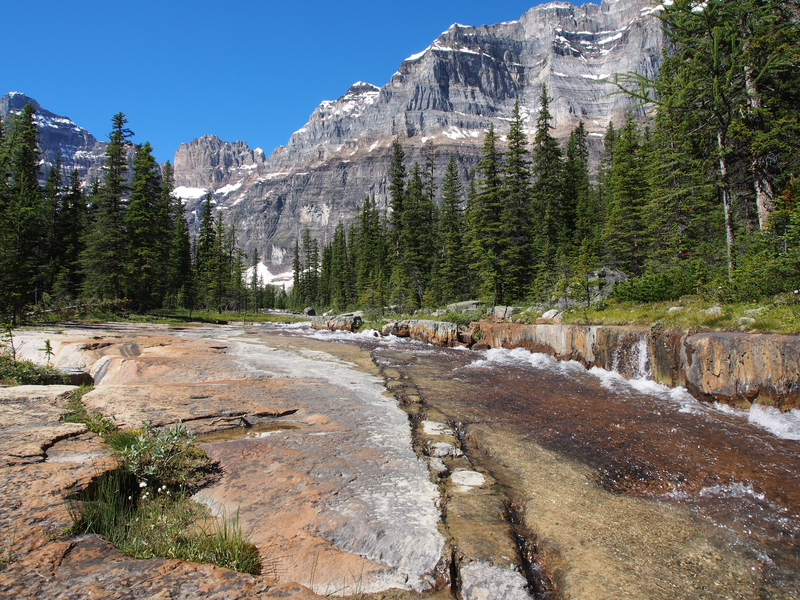 Until 2006, there was an optional “loop” aspect to this hike that paralleled the creek downstream along the valley bottom to the bridge just below Lake Annette. 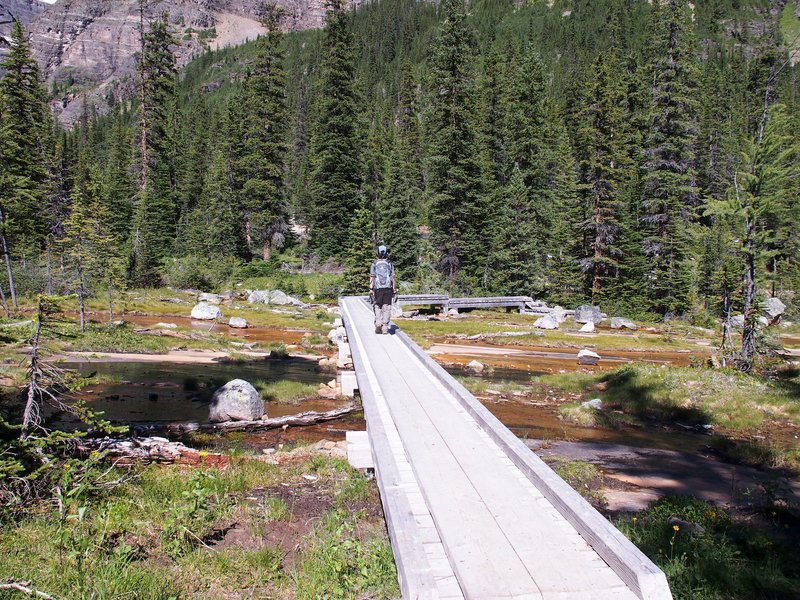 Parks Canada closed this trail in 2006 in order to provide more grazing range for grizzlies. As a result, we returned the way we came. It’s a short climb from the valley bottom, but between that short climb and some other up-and-down sections, the total elevation gain for this hike is more than double the net 385 meters. Our GPS track showed total elevation gain of almost 800 meters over the 20 km hike. 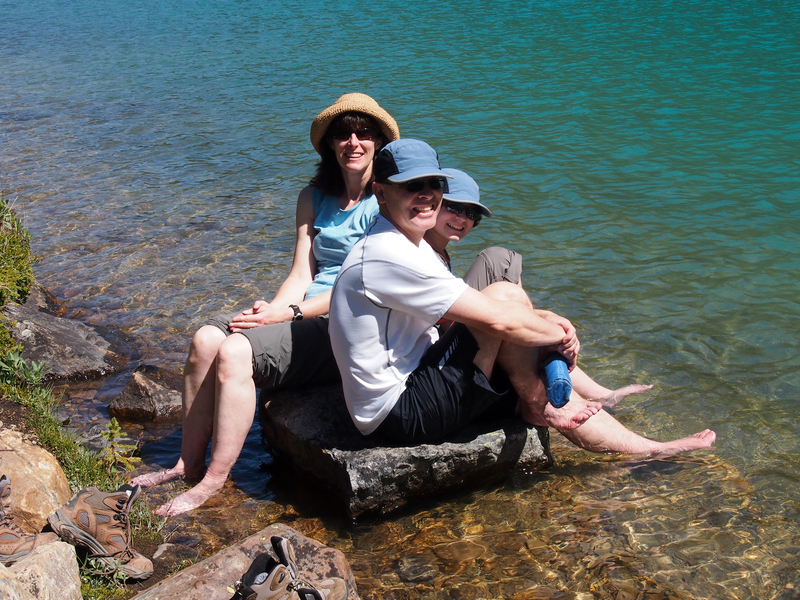 We stopped briefly at Lake Annette to plunge our feet into the icy water. C wouldn’t join the fun, but that meant he was free to take our picture as we cooled off! Mr. GeoKs’ achilles tendon was acting up, as was K’s heel, so on our return trek we stopped at Lake Annette just long enough for some cold therapy. Mrs. GeoK managed a slow 10 count and experienced bone-numbing cold. K and Mr. GeoK only submerged their feet for a few seconds at a time, but that was enough cold therapy to close the “portals of pain” so they could finish the return hike without discomfort. From Lake Annette back to the trailhead is a pretty easy, uneventful 5 km or so. We were back at the jam-packed parking lot about 3:30, so we were on the trail just under 7 hours. Aside from the creek crossings, wildflowers, and occasional glimpses of Mount Temple, it’s a long and fairly boring walk from Lake Annette back to the trailhead parking lot. Mrs. GeoK amused herself by shooting photos of as many different types of mushrooms as she could find. K was a good spotter. 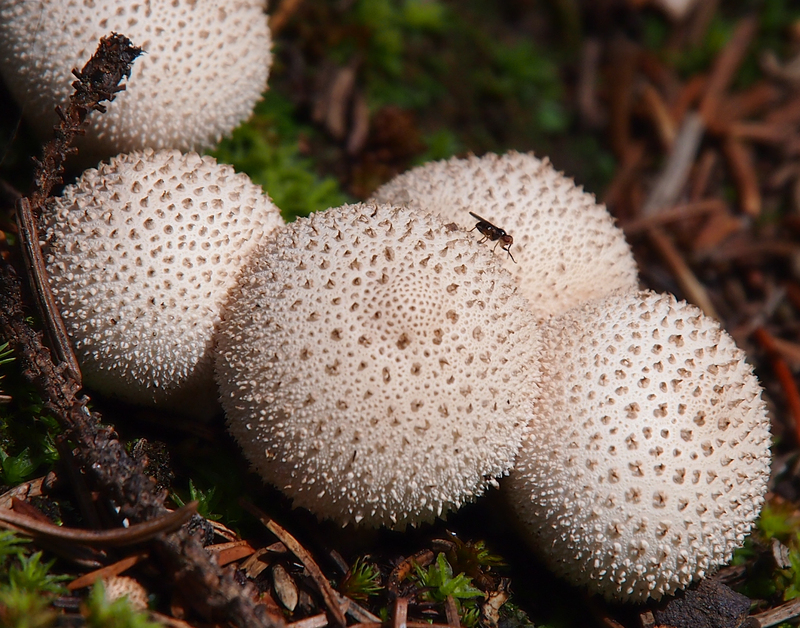 We finished the hike with photos of 7 different types, including these spiny puffballs (Lycoperdon). 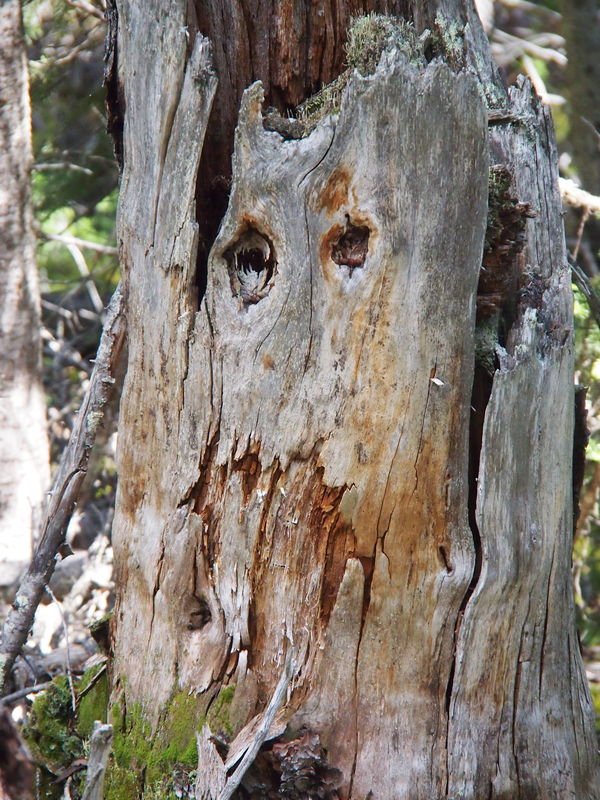 Mr. GeoK spotted this grumpy tree stump beside the trail as we made our way back to the trailhead – another welcome distraction on a somewhat boring section of the trail. 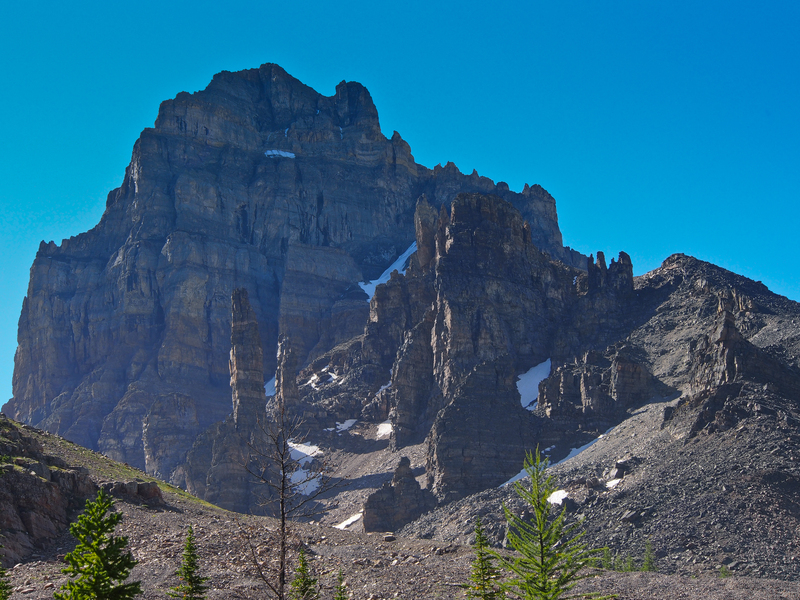 Options – A popular option is to hike over Sentinel Pass to the Larch Valley trail (or come the other way). Unless you bring two vehicles for a shuttle, you’re looking at hitching a ride from one parking lot to the other (probably not too difficult given how popular Moraine Lake is) or walking another 9.5 km along the Moraine Lake Highline Trail (share with mountain bikes) to return to your vehicle. NOTE – Although we didn’t encounter any bears this trip, they are frequently seen in the area. Be sure to follow the usual precautions (make lots of noise, carry bear spray, etc.) 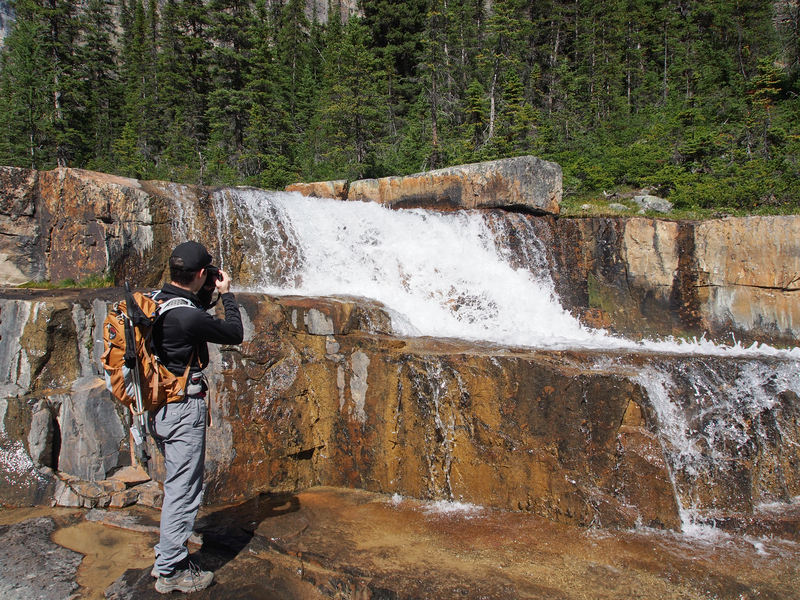 and check the Parks Canada website for any hiking restrictions. ← Bald-faced Hornet Nest – Leave it be? Or call pest control? Great pics + trail report! I was so sad to find out that the valley was a no-go during our visit last may but then, we’ve had a blast in the rockies doing other hikes – plus we’ve got another reason to come back sometime 😉 keep hiking! Looking forward to seeing more photos from your time in Lake Louise. Wonderful post and photos! We were in Banff years ago but it is in our memory with all its beauty, fresh air, animals and even delicious muffins in the cafeteria at the edge of the city. How long is this hike to the giant steps? to lake annette? Return distance to the Giant Steps is 20 km. If I remember correctly, return distance to Lake Annette is around 9 km. Be sure to check for trail restrictions / minimum group size requirements on the Parks Canada website before heading out. Loved reading this and seeing your fantastic photos! Am doing this hike next weekend and really looking forward to it. Thanks for posting–very helpful. We’re planning to see the Sentinels from the other side tomorrow, hiking Larch Valley to Sentinel Pass. It’s an easy 11 km and a good one to start our hiking season. I hope you enjoy the hike and would be interested in hearing whether the recent flood-inducing rainfall had any effect in Paradise Valley.